One of the most buzzed about independent releases last year was anthology Volumes of Blood: Horror Stories, a sequel to 2015’s Volumes of Blood, that brings together some serious talent for another collection of atmospheric, gory shorts, and it’s coming home on Blu-ray this summer. Among the segments included is “Trick or Treat,” set on Halloween night and featuring the masked killer known as The Harvester, but that’s just one of the flavors in this treat bag. The movie-within-a-movie “Murder Death Killer” offers some fun commentary and a familiar debate on slasher remakes while creating a new icon of its own in a killer scarecrow named Atticus Crow. Among the most effective shorts is a colorful Christmas story with a wickedly evil twist, and true to its name, the blood flows freely through each of the segments. The film as a whole boasts stellar production value, especially considering it was made with such a low budget. While the Halloween segments in both this and the original Volumes are great, all of the shorts wrap in and out of each other and pay homage to many of the classics with obvious affection for the genre. Read on for the official press release, and then get a taste of Blood with the new trailer. From genre label Dark Cuts comes a stirring volume of bloodcurdling horror from Blood Moon Pictures. In the tradition of cult classics Creepshow and V/H/S, comes Volumes of Blood : Horror Stories – a collection of bleedingly original horror from some of today’s most gifted genre filmmakers, including Justin Seaman (The Barn), Sean Blevins (A Brush with Death), and John Mayard (Nearly Dead)! Featuring the work of Sean Blevins, John William Holt, Jon Maynard, Nathan Thomas Milliner, Justin Seaman, and James Treakle with an ensemble cast including Cindy Maples, Moses Moseley, Theo Kostaridis, and Thomas Dunbar, Volumes of Blood : Horror Stories features seven original stories craftily assembled by producing team P.J. Starks, Eric Huskisson (The Confession of Fred Krueger), and Christopher Bower (The Dooms Chapel Horror). The official synopsis: A couple plans to purchase an old home, but would like one last tour before the closing. They’re guided around the estate by a creepy realtor that may have more in store than they bargained for. Searching floor by floor, they begin to discover the remnants of its sordid and terrifying past… A popular 80’s franchise gets a modern upgrade, but at what price? On Halloween night a teen left home alone meets a trick or treater that wants more than just candy. A door to door insurance salesman makes a Thanksgiving house call with monstrous consequences. Andrew and Sara are happily married and plan on spending some quality time together, but something sinister has other plans for their evening. Carol’s Christmas Eve turns into a fight for survival when a vengeful stranger isn’t feeling the holiday spirit. Lastly, a birthday party turns bloody when some unexpected guests drop by at the wrong time. Seven interwoven tales of terror, how many stories does your house have? 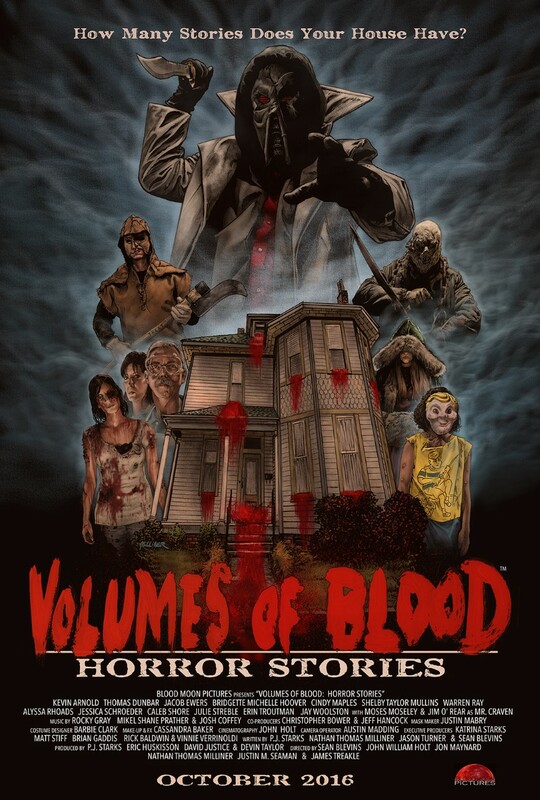 Volumes of Blood: Horror Stories will be released on DVD, Blu-ray, and VOD on August 1. Check out the new trailer below, as well as the teaser poster for the recently announced third chapter in the Volumes of Blood trilogy, Devil’s Knight!